I admit that I never really gave it any thought. But, the cod fish is kinda pretty. This vintage botanical book plate was identified as being of the Gadus Luscus species of fish. 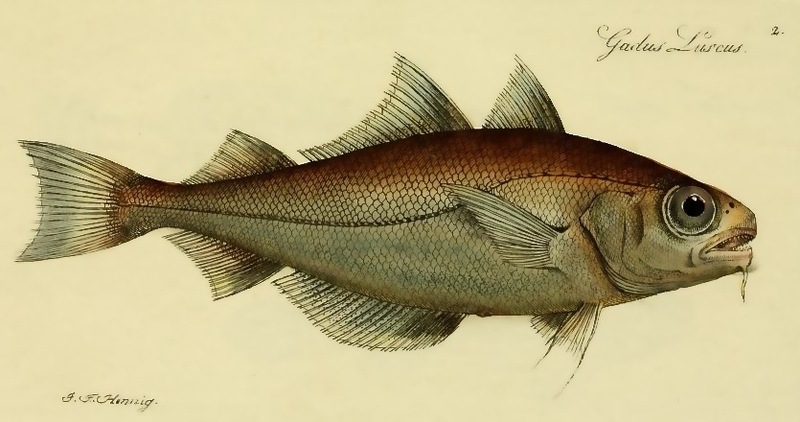 Around the time the book was published, these fish were listed as being common along the rocky parts of the British coasts. They are also called Blebs, Blinds and Pouts. The book this colorful fish image was included in was called Systema ichthyologiae iconibus CX illustratum. The beautiful plates were created by Marcus Elieser Bloch (1723-1799). It was published in 1801. Book plates like this one were most likely hand-painted. Books like this one must have been only available to the wealthy. How lucky are we that these wonderful vintage materials have been preserved so that we may use them for our own projects?